Atwood Magazine presents our guide to the 10th Anniversary of Brooklyn’s Northside Festival, with performances from Snail Mail, Parquet Courts, Dirty Fences, and more! Northside Festival is celebrating its 10th Anniversary this upcoming weekend. The Brooklyn festival is stacked with over 300 artists and 150 speakers on innovation at more than 30 venues across New York’s premiere borough for the arts and community alike. With hundreds of artists, it can feel beyond overwhelming to choose which showcases to catch this year, so we decided to create a guide to help you navigate the expansive festival. You can thank us later. Music kicks off on Thursday night. To celebrate a decade of music, Northside doesn’t disappoint for their first day. Soccer Mommy opens for Liz Phair at National Sawdust, Heater and Holy Wave join forces at Alphaville and Snail Mail headlines a sold out set at Music Hall of Williamsburg. Through Sunday evening, countless local and national acts will take on stages all across Brooklyn bringing a sea of music to city that never sleeps. Below we covered all of the sets that we’re anxiously awaiting! Nashville’s Soccer Mommy, once a DIY bedroom pop solo project, has grown into a full band with Sophie Allison’s most recent release, Clean. Between the equitable vulnerabilities and pristine musical artistry of Soccer Mommy and Snail Mail it may prove to be nearly impossible to choose between the two. Luckily, National Sawdust and Music Hall of Williamsburg are right next to each other. If you planned to catch both sets like us, there is still hope! Snail Mail’s sold out set at Music Hall of Williamsburg comes one day before the release of their highly anticipated debut album, Lush. Lindsey Jordan’s adolescent musings turned songs are angsty, in a relatable, downtrodden way. After Snail Mail’s EP, Habit, hit the streets, their fame has quietly, but substantially grown over the last year, and not without purpose. See it for yourself on night one of Northside. Heaters and Holy Wave are a psychedelic pairing from the pearly, spaced out gates of heaven. Michigan’s Heaters are of an extraterrestrial world, one drenched in reverb and fuzz. The Lone Star State’s Holy Wave create with a mantra that is purely a haze of garage-psych, not unlike many of their Austin musical predecessors. These dueling acts will surely captivate with lush instrumentals and a particular brand of trippy psychedelia. Textured, math rock band, Peaer, are as agony fueled, as they are approachable. Each understated track is filled out by sounds mirroring anxiety, the prickly guitar always edging towards a true nervous break. Peaer might be prepared for the worst, but you can expect the opposite from their set at Knitting Factory. Kississippi’s name might be sweeter than sugar, but Philadelphia’s Zoë Reynolds writes music for the darker side of indie folk. Her lyricism tends to be solemn, forever lifted by her dreamy vocals. After struggling to release their debut album, Sunset Blush, we finally have the final product. One that is meant to be heard, especially through the least of promising days. Suburban Living are drenched in dreamy synth pop. The Philly quartet, by way of Virginia, are seasoned in the art of growth to create something cohesive, that never completely strays from their initial shoe-gaze roots. Native Sun, on the other hand, draws obvious influence from the 70’s punk scene created in their home city of New York. Their chaotic brand of rock and roll is a welcomed contrast to the earlier acts at Our Wicked Lady Friday evening. Katie von Schleicher, a Maryland now Brooklyn-based singer/songwriter, has much of the makings of Angel Olsen. Her vocal abilities are undeniable, yet feverishly melancholy. She commands attention in whatever space she takes up with her cuttingly raw talent. Katie von Schleicher is not an act to be missed. Lola Pistola plays music with as much fire and mood as her live act commands. Her raspy vocals force each grudge soaked track to be all the more intoxicating. Grim Streaker create abrasive punk rock that truly never gets tired. Grim Streaker paired with Lola Pistola and Native Sun will make for one of the most high energy showcases of the weekend. THICK is by far the most feel-good, pop-punk band to exist on this list. They are here for the party, and with all the thrashing and jumping that they do on stage, it’s hard to not want to join in with the Brooklyn-based three piece. THICK will also be performing Friday, June 8th at Muchmore’s. Public Practice may have played their first ever gig in March, but the act is shaping up to be one of the buzziest bands in Brooklyn. With less than a handful of shows under their belt, they are already making a ripple across the local music scene. Former members of the indie band Beverly, Public Practice are here to stay. They are also playing a set on Friday, June 8th at Elsewhere (Zone One). Seattle’s La Luz, coupled with Rhode Island’s Gymshorts makes Saturday night at Baby’s a highlight of Northside Festival. La Luz meld du-wop and surf pop in a fusion that proves simplicity can be more than enough. Gymshorts, on the other hand, are an explosion of stoner punk for the festival goers who are looking for music that is ferociously unfiltered. Bodega is delightfully named after a New York City cornerstone, something if you are an out-of-towner you may not know. Bodega as a band are bitingly fierce and energized with a purpose. You’ll see what I mean at their set. Mystery Lights, close friends of Bodega, are heading to Europe for the summer. This set at Our Wicked Lady doubles as a Northside showcase and as their 45 record release party. If you have to miss them on Saturday, catch Mystery Lights’ final New York set on Sunday at Our Wicked Lady, before they depart. New York’s Dirty Fences play infectious power punk that ignites the party where ever it’s heard. Each restless riff has been wrestled to the brink of explosion on their most recent album, Goodbye Love. Dirty Fences are a shot of rock and roll straight to the kisser. Half Waif explore melodies and synth in a beautiful, daunting display of yearning. The moody tracks are peppered with beautifully poetic percussion and hearty doses of lyrical honesty. Half Waif explore space throughout all of their tracks, while effortlessly layering each one. Parquet Courts are celebrating the release of their newest album, Wide Awake!, with not one, but three New York City shows. Creativity comes as no stranger to Parquet Courts, so in the ultimate display of uniqueness, the quartet are throwing the three parties in sync with the theme of land, sea, and air. Parquet Courts Northside showcase is part of the sea portion and takes place on a boat, a set that surely shouldn’t be missed. Cotillon, AKA Jordan Corso, is that of a mystery. Not so much so himself, but in the way his music can create an unavoidable sense of longing with each gloomy, down-tempo track. The smokey, blues saturated vocals of Breanna Barbara are intoxicating. She breathes musky swagger into each track, which makes for the perfect end to the most music packed weekend to hit Brooklyn all year long. 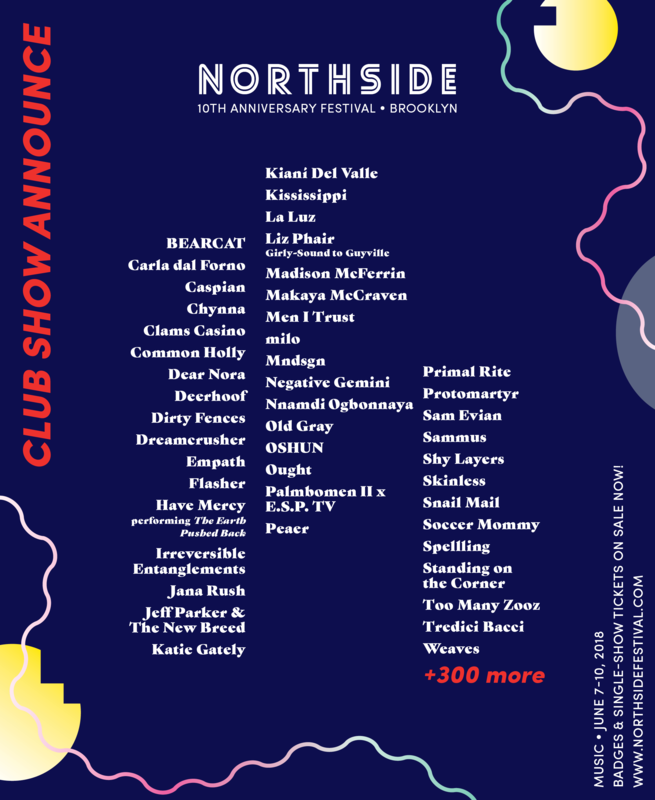 For tickets & more about Northside Festival, go to northsidefestival.com!